Using the daily data collected through GeoPoll’s Media Measurement Service, GeoPoll has analyzed the top TV stations in Nigeria for March 2015. GeoPoll’s data includes both ratings* and share** for all TV stations in Nigeria. When looking at average audience share over the month of March,GeoPoll found thatNTA andAIT are the top TV channels in Nigeria, with 21% and 16% average audience share respectively. 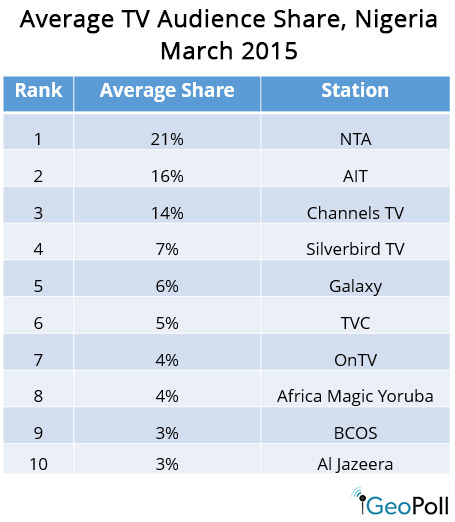 Channels TV had 14% audience share in March, followedby Silverbird TV at 7% and Galaxy at 6%. The stations not listed below, including region-specific stations in Nigeria, together accounted for 18% of audience share at the national level. GeoPoll also looked at average ratings for each time block in March, finding that NTA’s peak viewership time in March was from 9:00pm – 10:00pm, with a rating of 6.75 at 9:00pm and 6.74 at 9:30pm. AIT’s highest ratings came slightly earlier, with a high rating of 4.68 at 8:00pm. Channels TV also has a daily peak at 8:00pm, with an average rating of 3.38.